The latest version of SPListX for SharePoint offers administrators the option to export AD groups and their members while exporting SharePoint permissions. Apart from listing the Groups and their members, the XML file provides important AD attributes like Membership, UPN, SAM Account Name, Security ID, UPN, ID, Name, etc. 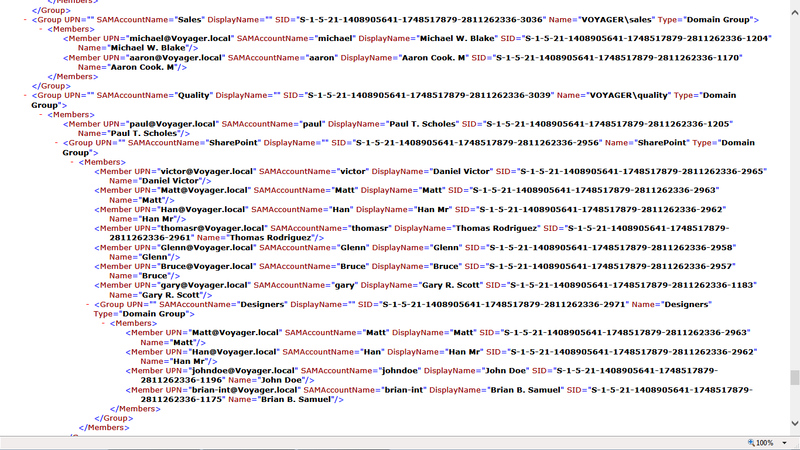 Here is a sample screenshot of the XML file showing the AD details. This export option is useful to administrators who want to find out which SharePoint Groups and Users are using which Sites / Lists and export this data to the file share. It is aimed at helping administrators identify in AD terms, the Groups and users associated with the Sites / Lists.